Like many Victorian political developments, the existence of unions in Victoria can be credited to the stonemasons winning the right to an 8-hour day without a reduction in pay. When this happened, other trades and services wanted to achieve the same rights, and the number of unions began to rise. However, these unions were initially only made accessible to a select group of trade workers. Most of the workers accepted into unions were male, employed, and of British descent. Women, the poor or unemployed, Aborigines and immigrants – like the Chinese – were often excluded. In August 1890, the union movement brought Melbourne to a standstill with a maritime workers' dispute. Shearers, waterside workers and sailors joined forces and went on strike in a complicated dispute with employers. On 31 August 1890, nearly 100,000 people – in a city of 400,000 – overwhelmed the streets of Melbourne and the banks of the Yarra in an enormous rally of support. Some 50,000 people were thrown out of work throughout Victoria because of the strike, including gas stokers, so an eerie darkness hung over Melbourne. You have been called out to render the civil powers assistance in maintaining law and order. [...] If you, in the execution of your duty, are called upon to charge the people, you must do your duty unflinchingly, even though you know your own flesh and blood, your brothers, and sisters, were in the crowd. If you are not prepared to discharge your duty faithfully, and in accordance with the oaths you have sworn, you have no right here. I don't think you will be called; but if you are, fire low and effectively. Treat any comment that may be levelled at you in the streets with silence. Don't lose your heads or your tempers. 'SHIPPING LABOUR DIFFICULTY. ', Launceston Examiner (Tas. : 1842 - 1899), 27 Sept, 1890, p. 3, viewed Nov 2013, <http://nla.gov.au/nla.news-article39556243>. This quote shows how first hand accounts can evoke the drama of an historical event. The idea that men were ordered to shoot protesters clearly communicates strong feelings towards events. Despite police action, the maritime workers were on strike for almost two months, but were eventually defeated, agreeing to their employers' terms and returning to work. 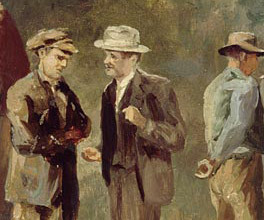 After the defeat, unions began exploring politics as a way of spreading their message and promoting the rights of workers. Unionists formed Labor parties, and their members stood for election and entered parliament in order to advance laws and community reforms that reflected the ideas and interests of workers. Despite government restructuring of the workplace and falling numbers, unions continue to play an important role in Australia today in the ongoing quest for fairness and equality in the workplace. With the 8-hour day won by the stonemasons, retail workers aspired to the same rights. Once a makeshift meeting place for unions, Trades Hall has become a Melbourne icon. In the 1850s, Victorian tradesmen fought for the right to equal hours of work, rest and play.